Posted on Monday, October 8th, 2018 at 11:29 am. I grew up in the Cherry Capital of the World, Traverse City, Michigan. A place where we called the tourists “fudgies”, you referred to where you lived by pointing at the little crack between your pinky and your ring finger on your hand and where my parents owned a roller skating rink called The Fun Factory. I raced my first bicycle race out behind McClain Cycles on their amazing BMX track and I bought my very first real road bike downtown at Brick Wheels. After school I used to motorpace behind my buddy Matt’s Motobecane moped out to his house on Long Lake. On the weekends we would ride our bikes out to the lighthouse on Old Mission Peninsula or I would ride past some random girls house 400 times in the hope I would run into her. The bicycle season in “the pinky” of Michigan is not exactly long and even though, at the time, I thought it was pretty hilly Michigan is actually devoid of any real climbing. The region is more well known for the Vasa Ski Trails, the National Cherry Festival and the Sleeping Bear Dunes, then the bicycle riding. Although, the much beloved Iceman Cometh is held there every year. 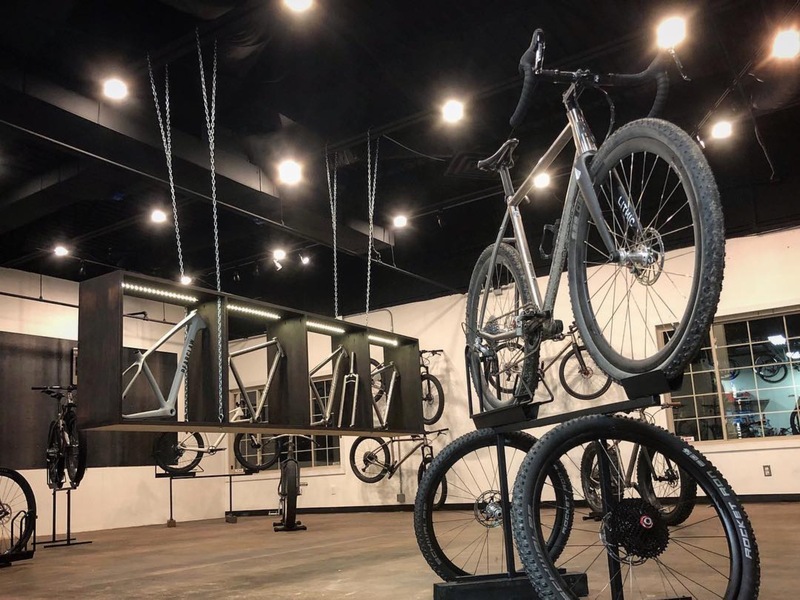 All of this is to say, I was pretty surprised when I found out about Bearclaw Bicycle, an upstart bicycle company is using the place of my birth to design, build and deliver some pretty interesting whips. I reached out to the owner and all thing Bearclaw, Jason Lowetz, to find out what gives and what follows is the full rundown on how he went from would-be rockstar in Los Angeles to two-wheeled evangelist in Traverse City, Michigan. You say you moved back to Michigan from LA to pursue a music career, but ended up selling and then making bicycles. Can you tell us a little bit of this story and are you still playing music? I lived in the Hollywood/Los Angeles area from 1999-2009. There I was living the dream as a a singer in a rock and roll band, Vibralounge, with my brother and a couple of good friends. We wore pleather jackets and giant sunglasses, and had our own signature hair do’s- mine was a tri-hawk. Even though we had ‘the look’, we were actually pretty darn strait-edge and never got into the party scene. Instead, we liked riding dirt bikes and mountain bikes- I liked the competitive aspect. I also love pushing myself to physical extremes. My brother and I, for 4 years in a row, rode from Los Angeles to Monterey, 300 miles, non-stop on new year’s eve. I currently put on a yearly 200 mile gravel bike race called the Sancho 200 and enjoy motivating others to push themselves. It’s amazing what we humans are capable of! While we made some interesting connections in the music industry, in the end it wasn’t to be, and we needed money to live on. Thanks to my ex-girlfriend’s dad (she’s my wife now), I sort of knew how to assemble a bike. When I applied for a job at Montrose Bike Shop, assembling a bike was the main part of my interview. They hired me on and I started riding and racing road bikes soon after. By 2009, I had gotten heavy into racing in Southern California. I was a Cat 1 roadie, man! We started a bike race team called Team Bearclaw after my alter ego, the ultra famous Chet Bearclaw. We had a cat 1 road team as well as 20+ other category road and mtb racers. I was one of the sprinters and took 1st at Manhattan Beach Grand Prix Criterium (my one major racing claim to fame). We had a 1970’s Winnebago team RV that also doubled as my brothers home. We were still living on a high horse. In 2009, I reunited with a former flame, Kristie, who was living in Denver. We were both ready for a change, and we decided to move back to Michigan together. I was rather surprised and impressed with the Michigan bike scene. I didn’t really have any expectations when I arrived, but quickly realized that there were some legit races. I started making connections and soon started another race team in Traverse City–Einstein Racing. We had quite a following, and it wasn’t long after that I opened up my own bike shop, Einstein Cycles. We started out small, in the garage, without a business loan. We borrowed money from a couple family members and maxed out our credit cards and quickly had a retail location (thanks to our garage shop getting shut down by the township!). The gamble paid off, and three years later and we were doing a million+ sales per year. The success of the shop allowed me to dive into the world of owning and operating my own bike brand. For 3 years now, Bearclaw Bicycle Co. has been my #1. I’m having a lot of fun with it. But yeah, music. Music will always be one of my many passions, but it’s become something I now do in my basement for my own enjoyment. Some day I hope to put some of it out there for the world, but for now, there is no pressure and no deadlines. Traverse City seems like a great place to go to the beach or maybe, in the winter, hit the nordic ski trails, but it seems like a strange place to start a bicycle company. How did you come to the decision Northern Michigan was a good place to influence bicycle design and start a bicycle brand? I opened my own bicycle shop, Einstein Cycles, in 2011. I quickly learned that I had to do something in the winter to generate revenue. I found some other people in the area with some interest in winter fat biking and we started making trail. We would snowshoe trails then ride them on our Salsa and Surly fat bikes. A few years later we were grooming trails by snowmobile and we were selling out of carbon Salsa Fat Bikes. I figured this was a good reason to start a new brand of bicycles. I was always curious about this and had made some connections in the industry over the years which gave me the confidence to go for it. I figured we could design a fat bike to be more like the 29er hardtail cross-country bikes we were riding all summer. I convinced my bank to loan me the money I would need to start this new venture, then got to work. A year or so later Bearclaw Bicycle Co. introduced the Balthazar, our carbon fat bike. The design was and still is a hit for us. It combines nimble cross-country bike handling with the ability to fit massive 5” tires. Oh, and we think it looks pretty neat too. 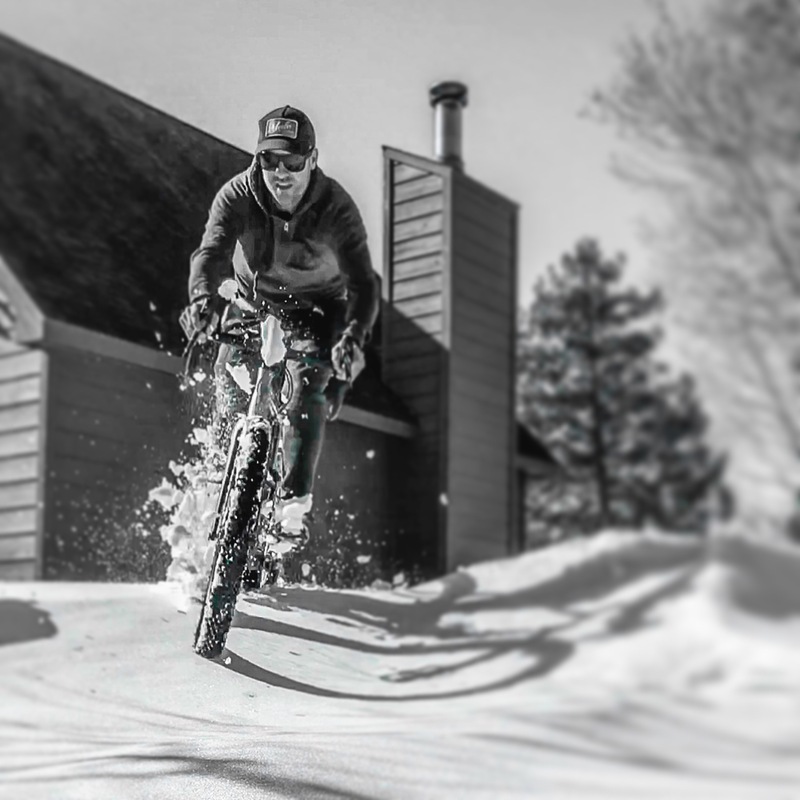 The next spring we realized that people didn’t stop riding our fat bikes even though the snow was gone. They were having too much fun floating through the sandy section of our trails and riding over obstacles they may not have otherwise ridden over. Turns out that big tires are ideal for Northern Michigan with its sandy terrain. We took this love for big tires to the gravel bike, too. 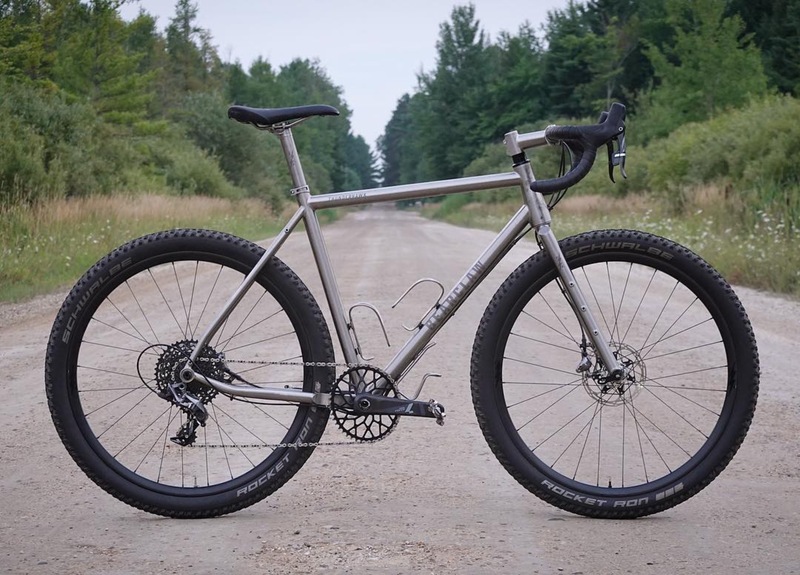 After spending a lot of time riding the gravel roads of Northern Michigan, I knew that the then current 35c max tire wide gravel bikes were not cutting it. We needed 700 x 50 or bigger. We were considering carbon for this new bike, but started to think about the abuse we wanted to put the bike through and ultimately landed on Titanium. We are now very much in love with Titanium. But yeah, to answer your question, Northern Michigan just so happens to be the perfect region for us. Tons of singletrack, 2-track, gravel roads, and paved roads to ride. Wildly different terrain and weather with each season. I believe the average temp was 6 degrees in February a few years ago. We also get a ton of lake-effect snow. Summers are warm and the soil is very sandy. The trails get pretty loose by mid-summer. Big tires rule this region. I believe you got your start working in bicycle shops. How did this influence your approach to Bearclaw Bicycles? That’s how BBCo. began and that’s what makes it so special. Our ability to have this direct retail connection with our BBCo. brand customers is very important. I really think people are loving it. These days it’s pretty much unheard of to have the kind of connection our customers have with us. Our contact number is my cell phone. Bearclaw started it’s existence with the Balthazar, a fat tire bicycle. It seems, based on what we saw at Interbike last year, that the fat tire bike might have seen its moment in the sun come and go. Where do you see fat tire bicycle fitting in going forward? Oh man, I don’t see fat bikes going away. They are too much fun to ride and can handle any terrain. I think you will start to see more and more of the snowbelt regions figuring out this winter fatbike trail grooming too. Our network of groomed Fat Bike winter trails here in Traverse City has grown to well over 20 miles. Marquette has a great winter bike scene too. Bearclaw is building bicycle which might actually reach the status of “one-quiver” rigs. Is this the goal? To build a bicycle which can go anywhere and do anything, with just a quick swap of wheels? Our bikes are all designed to fit an array of different wheel sizes. This makes them much more useful year round or for different events/terrain. Our Thunderhawk can be fitted with skinny road tires and win the local road race or you can toss 27.5×2.4 tires on and head deeep into nature. We are seeing more and more people go for the wider tires on our Thunderhawk. More and more people that love road cycling just want to have the ability to be far, far away from cars. If I only had one bike it would be a Thunderhawk. I could ride it across the country on paved or gravel roads, race it in a criterium, or shred singltrack for days on it. One bike. I would however have trouble in the winter on the Fat Bike trails. So I guess I need two bikes. Then of course I would also want a Ti fat bike for loading down and bike packing across the UP. So three bikes. There is a slight chance I may also need a fourth bike which is coming soon from a BBCo. near you, it’s specialty will be shred packing in the Colorado Rockies. It’s a slacked trail bike with room for bags, bottle, racks, etc. My good buddy, Buck Macho of Durango, is helping me design it. Sounds like the perfect job for Thunderhawk with wide range 10-46 gearing in the back and a 40-42 up front! I would run 27.5×2.25 Schwalbe Rocket Ron tires for their singletrack prowess and light weight. They roll pretty well on the pavement too. I’m Going to Portugal. Don’t Hate Me.